Net Weight: Packet (90 seeds)1/4oz (4000 seeds)(+$11)1oz (16000 seeds)(+$37)1/4lb (64000 seeds)(+$98) This item is currently out of stock! 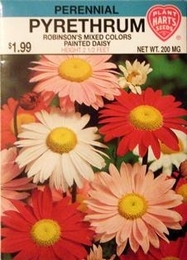 Pyrethrum Robinson�s Mixed Colors, Painted Daisy. This improved variety produces large single flowers in a mix of red, pink, rose and white shades. Excellent for background or plantings or as a cut flower. Pyrethrum flowers in early summer. Plant in garden in full sun where they will bloom year after year. Normally needs no winter protection except in areas with extreme winters.